An old friend living in Madrid, Maggie Schmidt, and her collaborator Laila El-Haddad have just released their book “The Gaza Kitchen: A Palestinian Culinary Journey” for pre-order. The Gaza Kitchen is a richly illustrated cookbook that explores the distinctive cuisine and food heritage of the area known prior to 1948 as the Gaza District—and that of the many refugees from elsewhere in Palestine who came to Gaza in 1948 and have been forced to stay there ever since. 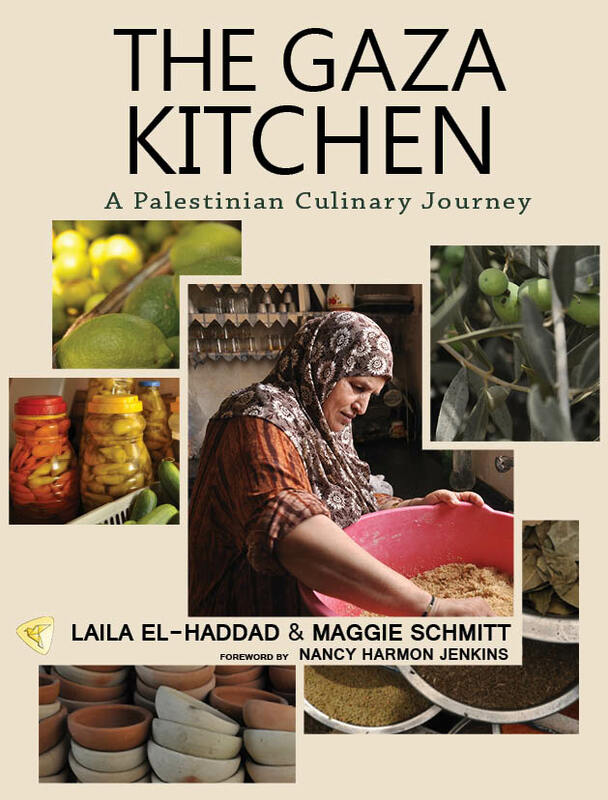 In summer 2010, authors Laila El-Haddad and Maggie Schmitt traveled the length and breadth of the Gaza Strip to collect the recipes presented in the book. They were also able to build on the extensive knowledge that Laila, herself a Palestinian from Gaza, had gained from family and friends throughout the years. The 130 recipes presented in this book have all been thoroughly kitchen-tested. Amounts are presented using U.S.-style measures, and the authors suggest alternative ingredients and recipe adaptations for cooks working in the United States or other countries where some of the ingredients may not be easy to find. Numerous illustrations help readers understand how to perform the listed techniques—and what the finished product should look like! But The Gaza Kitchenis not only a cookbook. A lot of other things happen in the kitchen as well as cooking: conversations, the re-telling of family histories, and the daily drama of surviving and creating spaces for pleasure in an embattled place. In this book, women and men from throughout Gaza tell their stories as they relate to cooking, farming, and the food economy: personal stories, family stories, and descriptions of the broader social and economic system in which they live. Why do we want to talk about food and cooking? Because food is the essence of the everyday. Beyond all the discourses, the positions and the polemics, there is the kitchen. And even in Gaza, that most tortured little strip of land, hundreds of thousands of women every day find ways to sustain their families and friends in body and spirit. They make the kitchen a stronghold against despair, and there craft necessity into pleasure and dignity. Gaza has a rich food tradition and a unique cuisine combining Levantine and Egyptian elements. The history of its population can be traced through its recipes, which reflect the influence of exile from all over Palestine as well as a changing society and customs. A cookbook which brings together these recipes serves as testimony to this heritage and history. What is more, today’s kitchens can tell us much about the difficult and paradoxical realities of Gaza after 3 years of unrelenting siege: which products are available and where they are coming from (tunnels, local agriculture, humanitarian relief), how cooks manage with extreme shortages of gas and electricity, how families reorganize to compensate for destroyed homes and near-universal joblessness. To spend a day with a Gazan woman doing the shopping and cooking is to understand the Palestinian reality from an entirely different – more material, more intimate – perspective. It is to appreciate the strength and endurance which allows these women every day to confront a hopeless situation and to create within it small spaces of grace, beauty and generosity. Just World Books is honored to have been able to work with Maggie and Laila in the preparation of this unique contribution to the study of the world’s food heritage.